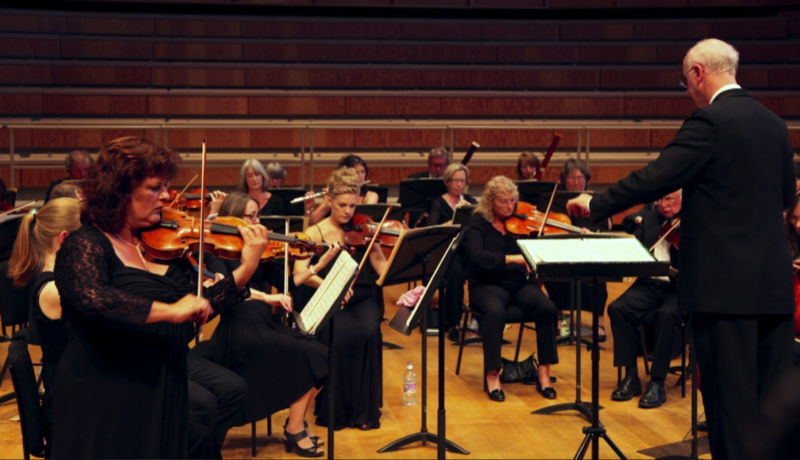 The Canterbury Orchestra joined forces with two choral societies to give a thrilling performance of Haydn’s great oratorio The Creation on Saturday14th May at the Colyer-Fergusson Hall. This masterpiece was inspired when Haydn – already in his sixties - visited London and heard just what a large orchestra with massed choirs could achieve at the Handel Festival in 1795. Haydn would certainly have enjoyed this performance with well over a hundred singers and the Canterbury Orchestra playing at its very best, combining subtlety and power when required. It is felicitous that the conductor, Andrew Lowen, who confessed before the concert began that this was his favourite choral piece, also trains two choirs – the Bearsted Choral Society and the Sittingbourne Orpheus Choral Society. Neither chorus auditions its singers – the desire to make music is enough - and yet these two well-directed groups proved themselves capable of singing beautifully in tune, with excellent balance, vigour and impact. The piece begins with a depiction of Chaos – a musical picture of a world without definition which was played with subtlety and sensitivity. The haunting solos of clarinet and oboe were particularly effective. We knew we were in for vocal distinction as soon as the singers rose to their feet to sing the opening words of Genesis recalling God’s creation of light – a musical expansion which begins with a tiny pizzicato in the strings culminating in a sudden surprise fortissimo chord from the choirs. It was electrifying. Parts one and two tell the story of the creation of the world before mankind and are narrated through arias and recitatives sung by three angels. The first narrative is given to the tenor, Greg Tassell, who sang with clarity and tender expression. The description of the waters is trusted to the bass solo, sung here by Stephen Charlesworth who with gentle vibrato complemented the delicate accompaniment of the orchestra led with authority by Karen Joliffe. “The Creation” is essentially a cheerful work, giving an optimistic view of humankind and Penelope Martin-Smith, the soprano soloist really came into her own with her portrayal of Eve in part three, creating the character with warmth and using her great dynamic and vocal range. Much of the work is an interplay between the trio of soloists and the chorus and it is to the singers’ great credit that the words were crystal clear throughout. The oratorio is well known for its rich tone-painting covering every emotion from the fury of the storms to the humour of the belching contrabassoon as it characterised the “heavy beasts”. There was not a weak point in this performance in the virtuoso display of instrumental capabilities. Early on, oboes and bassoons combined to create “the serpent error” of the river against some admirably precise violin playing. Perhaps the highlight of the concert came when the woodwind tackle the main species of bird in turn, with the the trilling flute of Charlie Faux-Bowyer being particularly exquisite. The clarinets (new at the time) played their voluptuous melodies with graceful flair and the violas, ‘cellos and double basses made creditable “great whales! The recitatives, which needed only the baroque harpsichord and cello combination were played in masterly fashion by Michael Burleigh and Nathan Jones. If the arias gave us the beauty of Haydn’s pictorial imagination, then it was the choruses which provided the real exhilaration of fine contrapuntal music making. “The Heavens are Telling!” was particularly joyful and the final chorus prompted rousing applause from an audience appreciative of Andrew Lowen’s accomplished direction of this magnificent work. However, perhaps the chorus at the end of the six days of creation was the real climax and tribute to the performance: “Achieved is the glorious work”. Indeed!